Opponents of the controversial Digital Economy Bill have urged MPs to give it "the debate it deserves" when it is discussed in the Commons later. The bill includes plans to give Ofcom powers to cut off internet connections of persistent net pirates and measures which could see some websites blocked. Campaigners have booked newspaper ads claiming the government aims to "fast track it into law before the election". The government said the bill had been debated several times. 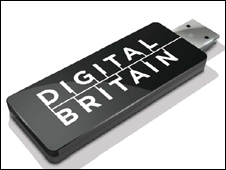 "The Digital Economy Bill has been extensively debated and scrutinised in the House of Lords, with seven days in Committee and three days in Report Stage," a spokesperson for the Department of Business Innovation and Skills (Bis) told the BBC. "The bill spent three months in the House of Lords, and we have made significant amendments to strengthen and clarify it." The second reading of the bill will begin at around 1530 BST. The discussion would "carry on through the day as required", said the spokesman. It is supported by the creative industries and organisations such as the trade union-led Creative Coalition Campaign (CCC), which has encouraged people to write to their MP to back the bill. The CCC has taken out a full-page newspaper advert which appears in the Guardian asking MPs to support the bill, saying: "We need to act now before even more jobs come under threat." The opposition advert, which appears in the Guardian and the Times, was bought by the Open Rights Group (ORG) and digital campaigners 38 Degrees, paid for by donations. Headlined "20,684 of us demand a proper debate on the Digital Economy Bill", it claims that most people have "major worries" about the plans but they are being fast-tracked into law "sidestepping debate and opposition". The campaigners have been encouraging people to e-mail their MP to protest against the bill and say that 20,684 have already done so. But the ORG believes the bill may be pushed through in the so-called "wash-up" period, where outstanding bills are quickly vetted and voted through Parliament usually in the last 48 or 72 hours before a dissolution. The Bis spokesperson said it was not possible to predict whether the bill would be part of "any hypothetical 'wash-up' period". The Digital Economy Bill contains several controversial elements, including a so-called "three strikes rule", which would give regulator Ofcom new powers to disconnect or slow down the connections of persistent net pirates. A recent industry study, by economics firm TERA Consultants on behalf of the International Chamber of Commerce, said that the UK's creative industries experienced losses of 1.4bn euros (£1.2bn) in 2008 due to piracy. "The bill is a sensible and much needed response to what has become an unacceptable situation for those whose livelihoods depend on the success of the creative industries," said Martin Spence, assistant general secretary of Bectu and a representative of CCC. But critics of the bill - including several leading internet service providers (ISPs) - say it can be difficult to identify persistent file-sharers, particularly those that share a web connection or use a public access point. The opposition adverts say that this "could mean millions of homes, schools and libraries are threatened with internet disconnection and tribunals". "It could also spell the end of free, open wireless internet in the UK," it continues. ORG have also outlined concerns to Clause 18 of the bill. This originally outlined how the government intended to create the power to deal with new unforeseen methods of copyright infringement, without the need for further legislation. Powers could include the right to block access to websites. The clause has been amended several times, with one version presented to the House of Lords shown to have been largely drafted by music industry group the BPI. Web firms including Google and Facebook have objected to previous drafts. A new amendment - to be introduced at the second reading - grants "limited power to propose regulations in the future", including the ability to block websites, after consultation with industry. "We think clauses 11 to 18 - which allow people to be disconnected and websites to be blocked - should be dropped," said ORG's Jim Killock. In recent days, the bill's opponents have done their best to prove to the politicians that they've misread the public mood. Other groups have also spoken out about the bill. Jeremy Silver, acting CEO of the Featured Artists Coalition, which campaigns for performers' and musicians' rights, said the bill was of "tremendous importance" and much of it was "very valuable". "However, there are quite a few sections which are quite controversial and quite difficult to understand and have been amended a lot during the course of the passage of the bill," he said. "If democracy is to be meaningful in a case like this then that debate needs to be aired and continued in the right places," said Mr Silver. He also questioned whether dealing with it during the "wash-up" period would be appropriate for a bill on which there was such a lack of consensus. The Liberal Democrats have said they will oppose any plans to rush it into law and have called for the bill in its present form to be scrapped and re-introduced in the next Parliament.